Betty Bothereau, owner of L'Attitude Gallery, has curated an exhibit of outdoor sculptures that will be on display at the Boston Convention and Exhibition Center for the coming year. 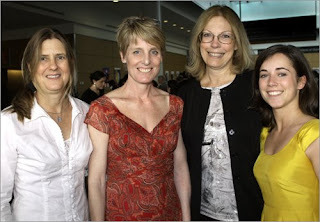 On June 20, over 250 guests attended a reception for the Fourth Annual Summer Street Solstice Art Celebration and Kick Off Event for the SummersDay Revels held at BCEC. 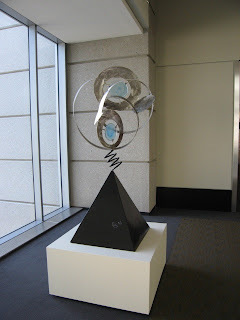 Sculptors whose work is represented in the show include Rob Lorenson, Ian Mogavero, Patrick Pierce, Reno Pisano, Otello Guarducci, Whitmore Boogaerts, and Pan QuQin. Above photo: Art consultants involved with the outdoor sculpture show (l to r): Kathi Taylor of South Boston, Sue Merritt of Back Bay, Betty Bothereau of Milton and Ashley Flowers of Milton. (Photo by Bill Brett, The Boston Globe). 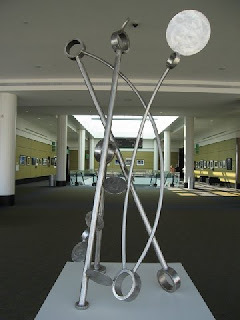 Below: "Bending Thoughts" by Whitmore Boogaerts (stainless steel) - one of the sculptures in the Boston Convention and Exhibition Center. Below: Sculptor, Ian Mogavero with Betty next to his sculpture, "A Day in the Park". 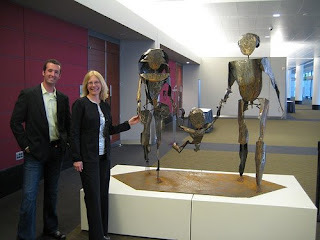 Dave Borrus has created a lovely "Father & Child" sculpture in bronze. It is 21" high x 6" wide x 4" deep. A fun gift for the new father - or for any father for that matter! Mosaic artist, Bette Ann Libby, is creating 16 new flower mosaics for the Parent Sleep Area at Children's Hospital in Boston - with the help of patients, their familes and CHB staff. 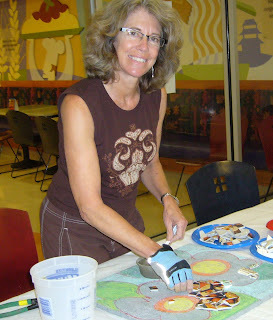 Libby is running a workshop in the Cafe at Children's this week, June 3, 4, and 5 from 11am - 3pm. 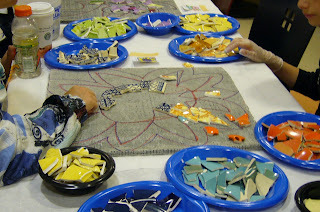 All are welcome to participate in placing ceramic fragments into the designs created by Libby, who also offers mosaic workshops in her studio in Brookline, MA. The idea for this project stemmed from a collaboration between L'Attitude Gallery owner, Betty Bothereau, and the hospital's Art Coordinator, Jessica Finch. For more information, contact Erin McColgan at Children's Hospital 617-919-3110. We were surprised and delighted yesterday when guitar legend, Eric Clapton, came to the gallery -- and purchased several scuptural objects for his boat. Clapton is in Boston for a concert tomorrow night at the Tweeter Center. We were pleased that he stopped by and that we were able to find several stone scuptures (including four pieces by entertainment reporter turned stone sculptor Dixie Whatley), glass pieces and a ceramic vessel that suited his taste.